The smallest of the Italian yard's models, the 17-meter custom yacht Arcadia Sherpa Panta Rei III, of the Renaissance series, abandons her usual livery to go inside and outside haute couture. The transformation began with the owner's request to paint the classic hull of the boat in the Rolls Royce iconic Silver Sand color, which took over two months to perform, as the new paint had to prove resistance in the marine environment. 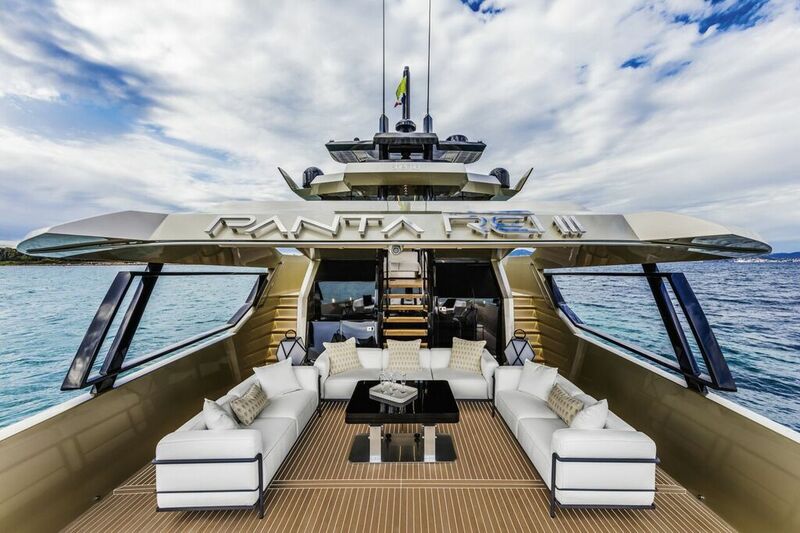 This elegant hue is meant to interplay with the boat's all-teak decks and the two signature lacquered side panels of the superstructure that run parallel to the stairs onto the sky lounge. 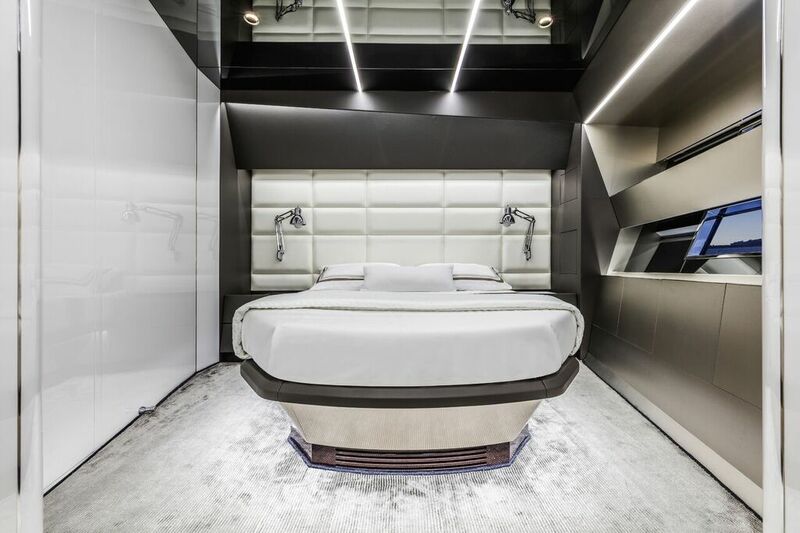 The classic lines of the hull are inspired by the working vessel aesthetics, while the superstructure wisely extends the shaded area of the main deck, providing shelter around the aft-facing C-shaped sofa. Just one step down, guests find themselves on the 50-square meter sea-skimming terrace, which has added pop-up Secret Light L low energy lights to enjoy cozy summer nights onboard. In turn, the sky lounge can be converted into an enclosed space, when its side windows are risen up to the hard top. The focus placed on multifunctional social areas does not by any means neglect the importance of interior space, featuring muscular forms and replete with handcrafted adornments, such as the hand-woven Jacaranda Chapatur carpet. 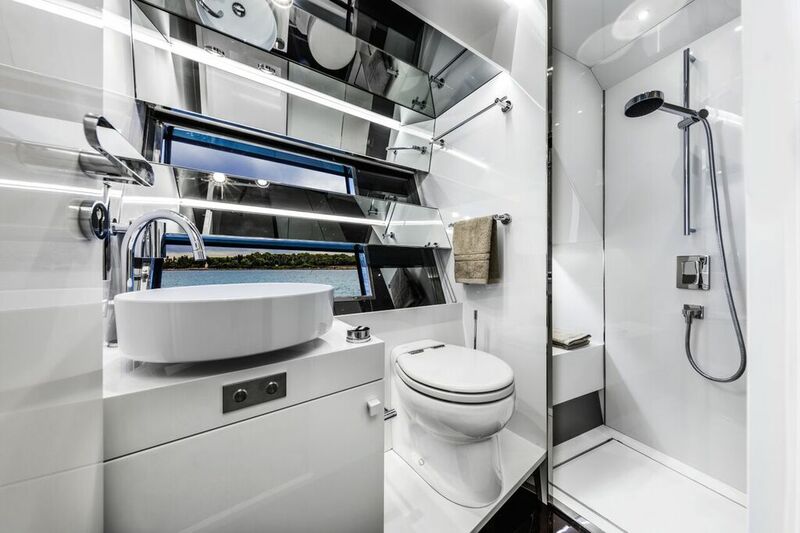 The two-cabin layout comprises a master suite with floor and bulkheads trimmed in dark oak, which comes complete with a spacious bathroom made and edged in rare marbles with ceiling trimmed in the grey-tinted mirrored glass. The luxurious guest cabin also boasts a ceiling of 2 meters high and features a separate bath with shower. Arcadia Sherpa Panta Rei III is built upon the yard's proven semi-displacement hull first introduced in the 1960s and is powered by Volvo Penta IPS600 engines with low fuel consumption.